If you cannot find the variant you need, contact us here and we can source it for you. Probably the most important instrument to a glider pilot, the vario is the ultimate sensitive instrument! Measuring the difference between static pressure and a reference chamber, minute differences in pressure indicate the rising or sinking of the glider. The speed and rate of the reaction give the pilot the information he needs to stop and climb or speed up and move on to find lift. Winter have been making vario’s since the 1930’s and both materials and methods of construction have changed. These super sensitive instruments now employ shock proof jewel bearings and ultra-fine springs to centre the measuring vane. The science bit, how does it work? Vane type variometers measure the change in air pressure inherent to changes in altitude. The instrument consists of a cylindrical chamber with a precision-fit baffle (vane) rotating on shockproof jewel bearings and centered by a coil spring. The vane divides the chamber in two: one section is open to static pressure, while the other is connected to an expansion tank, in which a volume of air is insulated against the thermal effects. Differences in pressure are compensated by the narrow gap between vane and chamber wall. There is a change in static pressure when an aircraft climbs or descends, and a differential pressure is established between the two sections of the chamber. The resultant deflection of the vane provides a measure of the vertical speed and these deflections are transferred to the pointer of the instrument. The response rate of a variometer is important. In high performance gliding, up-currents can be identified all the quicker and used all the more efficiently if the variometer responds without delay. Defined as the length of time the instrument takes to reach 65 % of its final reading in response to a sudden change in vertical speed, the time constant serves as a standard for gauging speed of response. The faster a variometer responds, the smaller the time constant. Choosing the right Vario for you? There are three main choices you need to make, firstly if you have space for an 80mm or a 57mm instrument in the panel. Next, if you would like a linear or logarithmic scale and finally if not a logarithmic vario, would you like a super-fast one! All vario’s are supplied with the corresponding expansion tank. Please note, if you require a fast vario, the tank is twice as big or you need two smaller tanks so you need to think about where you put it behind your instrument panel! We supply all vario’s with a +- 10kt scale but other units are available on request. Lastly, we can also supply MacCready rings for your glider, just let us know the glider make and model and we can have one of these marked up for you. 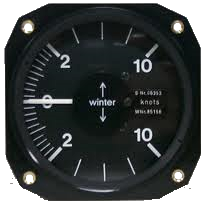 All Winter Variometer’s are available with a MacCready speed ring customised to your glider type. 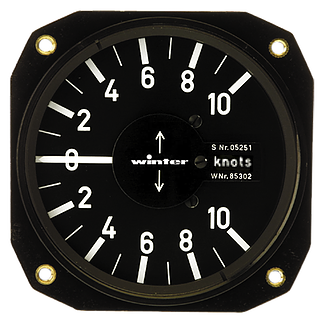 This is a really simple tool you can add to your winter vario to give you an indication of the speed to fly. The MacCready speed rings clip onto the bezel of an existing Winter vario.